For the first few years of my kids’ lives, we lived pretty close to our families. Only about 6 hours from my in-laws, and a whopping 7 blocks from my whole side. The kids loved it, especially all the playtime! Since moving to Texas, it’s been a big challenge maintaining those relationships between the kids and their grandmas, aunts, cousins…everybody! With your help, this new Kickstarter campaign allows families to Connect From Any Distance with Kinskii! Last weekend, my family and I were invited to attend the big Launch Party for #KickstartKinskii – and it was AMAZING! So many fun activities, great people, delicious food AND I got to try out their awesome games. So what is Kinskii? In a nutshell, it’s the combination of video chat technology and the simple human connection through play. They go way above and beyond Skype, which is pretty much limited to a phone call while seeing each other, and actually create GAMES you can play online WITH your loved ones! The games have a spot where the camera will capture the face of the child (or you!) playing, PLUS one for the other end (Grandma, perhaps?). They’re literally playing TOGETHER, working as a team in a science lab mixing colors or taking on the grocery store. It’s so simple to figure out, our kiddos had a blast playing together at the party! I can’t wait to get involved, since I believe this will be AMAZING for my kids to play with their relatives so far away. Phone calls don’t cut it, they need to play, do activities, and LAUGH together to really make those connections and create the lasting memories. PLEASE go support them by pledging something on Kickstarter…even if it’s just $2…so Kinskii can help even more families make playful, lasting memories even from afar! This week was FABULOUS, and I hope y’all had a wonderful Thanksgiving holiday, as well! Despite all of us being pretty darn sick, we still spent lots of time together watching movies, playing games, and getting excited about the upcoming month. Since running around wasn’t an option with our coughs, we enjoyed simple games that were still a blast, like this Don’t Eat Santa Printable Game Card! Do you remember my Don’t Eat Olaf game card from my daughter’s Frozen birthday party? This is the same concept as that, only it’s Santa! 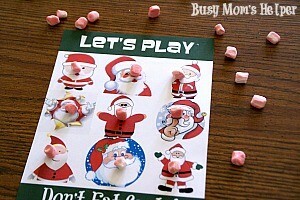 All you have to do is print of this Don’t Eat Santa Game Card and get some type of game pieces (candy, marshmallows, scraps of paper, whatever!). Place candy/marshmallows/something on each of the Santa faces on the card. Choose a person who is ‘it’. They leave the room while everyone else chooses which Santa is the one for that round. The person comes back in and one by one picks off the candy on each Santa. When they try to pick up the piece on the chosen Santa, everyone yells ‘Don’t Eat Santa’! The person gets to keep the candies they pulled off up until they got to that one Santa. So the basic goal is to choose the ‘right’ Santa last, so you can get as much of the candies as possible! 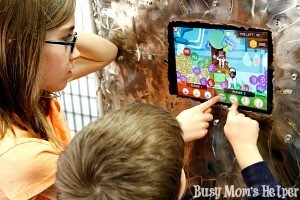 The kids love it, and it’s really easy enough for even our youngest to play! I’d recommend laminating the game card (it prints 8.5×11, by the way)…that way it stays clean and lasts MUCH longer! This post contains affiliate links. See my disclosure policy here. I was provided free Play Doh Sets to try out for this celebration, but all opinions are my own. Do you remember playing with Play Doh when you were a kid? 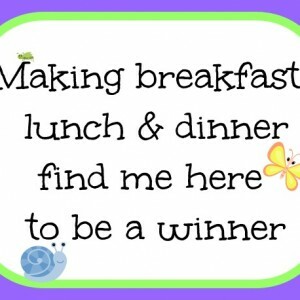 Perhaps even eating eat…well, let’s just not go there right now! But still, it was such a fun activity and still is for me! 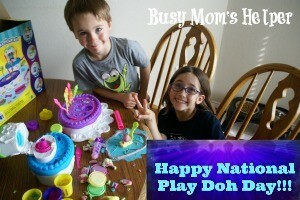 Now I get to enjoy it with my four, crazy kiddos, especially since today is National Play Doh Day! Woot Woot! I had no idea a holiday like today even existed, until I got an email late last week asking if I wanted to help celebrate. Come on, a day just to celebrate the awesome-ness that is Play Doh? Heck, ya I wanna join in! The awesome people at Play Doh even offered to send three of their super-fun play sets for us to enjoy our celebration with! This Play Doh Sweet Shoppe Cake Mountain Playset was a blast! The kids made little cakes with neat little details and designs, could even ‘frost’ their creations! The boys favorite was definitely this Play-Doh Diggin’ Rigs Buzzsaw Playset . Create logs and bricks, cut them up, stack ’em. And by using a big truck? 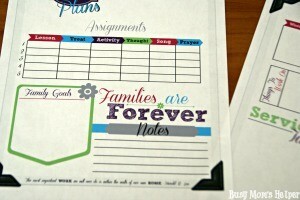 Ya, any boy-mamas out there….this would be an awesome thing for your guys! Last, but certainly not least, they kindly gave us the Play-Doh Mix ‘n Match Magical Designs Palace Set Featuring Disney Princess Aurora . Although Wonder Woman loved the princess theme, it seemed Batman enjoyed decorating the castle and creating some beautiful ‘doh’ dresses with this! I thought it would be a good idea, in celebration of National Play Doh Day, to explain the top 4 reasons why this mama completely loves Play Doh! 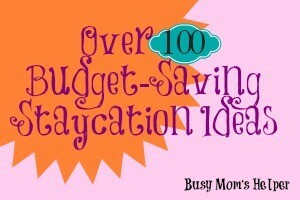 Reason 4: It keeps the kiddos entertained for a L-O-N-G time! Reason 2: Their sense of accomplishment is totally rewarding! Reason 1: They GET ALONG and even WORK TOGETHER….they learn from each other, help out, truly have some quality sibling time. SCORE! Thank you so much to Play Doh for giving us a totally fabulous National Play Doh Day! We plan to continue celebrating many, many more days! First week of summer down, and we’re actually surviving…woohoo! Hope you’re enjoying your first bit of no school! I’m so glad I decided to do this Phineas & Ferb Summer Series…it’s been so nice having stuff to keep the kids entertained! They’re loving it, too…every day it’s “are we doing more Phineas & Ferb today”? I love it! 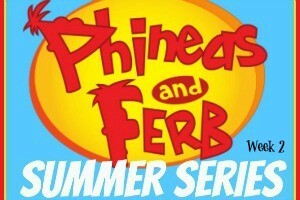 We’re on to week 2 of our Phineas & Ferb Summer Series, and it’s a blast! Some basic activities, and some majorly exciting ones! Here’s the breakdown for you week! Episode 4a: Are You My Mummy? Print this fun gumball coloring sheet. A very colorful booby trap! Create your own Mummy with this craft. Each mummy needs 4 craft sticks, some random fabric scraps, googly eyes, and either tape or glue. First, we attached the legs and arms to the main ‘body’ by putting a scrap wrapped securely around. Then just have the kids wrap scraps around to cover the mummy up. Attach googly eyes, and even draw a mouth, if you want! They loved their little mummies! Perry the Platypus gets stuck in a huge bubble by Dr. Doofenshmurtz. Make your own giant bubbles using Tatertots & Jello’s tutorial! 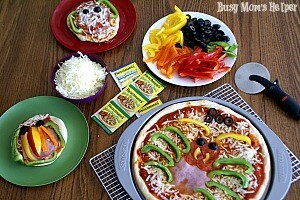 For a mummy-themed lunch, look at this adorable mummy meal idea! Print off Phineas’ check list for the day! Have the kids create their own song. Or, just have them learn the fun song on the episode! My 3-year-old loves singing it randomly, and it’s the cutest thing! Make your own guitar to rock out to your song! You’ll need a box (cereal boxes work), empty paper towel roll, paper of choice, tape, scissors and yarn or ribbon. Cut your main hole in the box, then one at the top for the roll (handle). Cover the box with paper, as well as the roll. Stick the roll into the hole at the top. Tape your yarn/ribbon inside the main hole on the box. Strum away on your new guitar! Just like the magazine covers with Lindana in the episode, have your kids design their own magazine cover featuring themselves! Buy, find or borrow a glasses/nose disguise just like Perry uses to hide from Linda as they’re stopped at a red light. Play ‘hide and seek’, trying to find the non-disguised Perry (take turns wearing the disguise)! Just like Dr. D’s huge wandering robot-building, turn your kids into robots! Get a box that fits their torso, remove the area where their legs will go and cut out holes for their head and arms (allow plenty of room, please). Let them decorate their ‘robot body’, then they can stomp around as a huge robot! Happy Birthday to Dr. D! Make his favorite, a pink ‘Doonkleberry’ cake. Any white or yellow cake recipe would work, just add a bit of red food coloring and pink frosting! 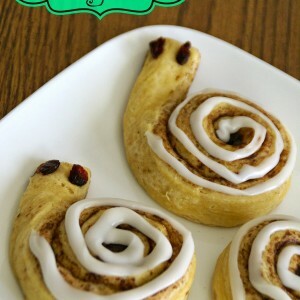 Another fun treat? Why not the green (possibly mint?) ice cream that began the whole fight between Phineas & Buford! Here’s an awesome Mint Chocolate Chip recipe from the Brown Eyed Baker! Have the kids design their own ‘Brawl at the Mall’ flyers. Create your own thumb-wrestling ring! You’ll need a small box (a large shoe box would work), paper of choice, tape, yarn or ribbon, 4-6 craft sticks, and scissors. Cut arched holes in the two large sides of your ‘ring’, so they can put their hands in. Cover the sides with paper. Cut two LARGE holes for their thumbs in the top, then cover with paper. Fold the paper in through the holes on top, so rough edges are covered (don’t want any cuts on those cute thumbs!). Attach the craft sticks at each corner of the ring, and in between if you’d like. String the yarn/ribbon between the poles. Have your kids duke it out thumb-wrestling style! How about those Doonkleberry Bats? So cute! You’ll need this printable, paper of choice, googly eyes, tape or glue, scissors, button for nose, ribbon for bowtie and hanging hook. To make, simply print out this sheet with the face and teeth shapes. Trace the kids’ hands to be used as the wings. Attach the teeth to the face, the wings behind the face, the googly eyes and button nose. Make a cute bowtie from the ribbon and attach at the neck. Include a ribbon loop at top for easy hanging. Enjoy your own Doonkleberry Bat! Don’t forget…we’d love to feature YOUR favorite Phineas & Ferb episodes, activities and other ideas! So don’t hesitate to share!